Christianity and the traditional family are the two things that stand in the way of a complete victory for progressivism. Thus, progressives are doing everything in their power to stamp out or subvert both institutions. I recently saw a meme on Twitter that provides a good example of how our progressive elites are subverting Christianity to help it advance their agenda. Progressives despise Christianity and the family. If they had their way, they would stamp both of them out. Leftists tried to actually do this in Soviet Russia. 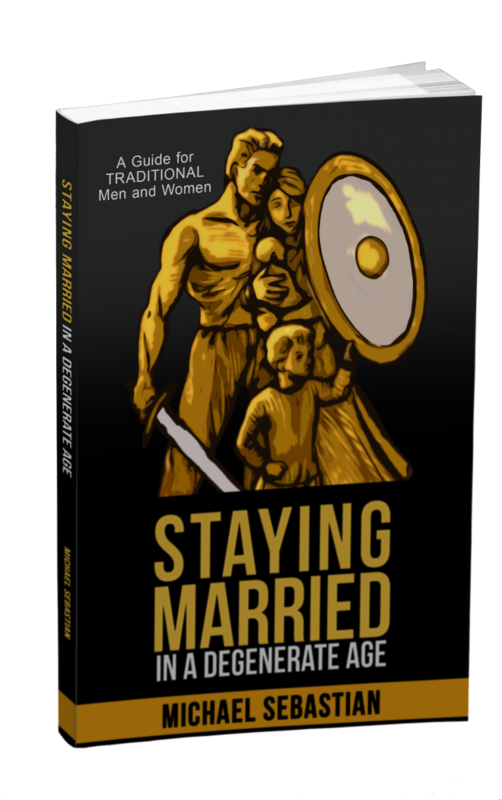 At first they tried to discourage marriage, but they quickly had to reverse their position when they ended up with too many orphans and fatherless children on their hands. The Marxist attempt to squash Christianity lasted a lot longer, but it was similarly unsuccessful. Modern day leftists are more pragmatic. While they still plan on doing away with both institutions, they know this will take decades—perhaps over a century—to fully implement. In the meantime, their strategy is to render both institutions ineffective through subversion. Here is an example of one of the ways they subvert the Christian message to serve their own purpose. Who is the message aimed at? I got the following meme on Twitter from a priest that I follow. As far as I can tell, he seems to be a solid priest so I am not accusing him of subversion. Rather, I think he tweeted it out thinking it was a very positive, uplifting message. 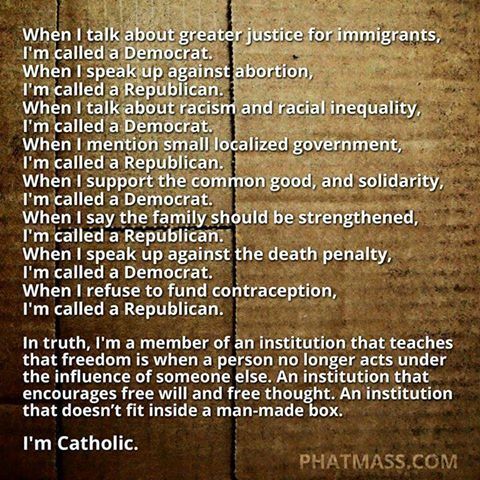 The meme consists of a bunch of statements that are intended to show that Catholic Christians do not fit into a political box. They follow the gospel of Christ (or at least what they think is the gospel of Christ) rather than political ideologies. Whenever you see or hear a message, the first thing to ask is “who is this targeted at?” Is it meant to sway outsiders? Or is it meant to confirm the insiders? In this case, it is pretty clear that this little meme is aimed at making Catholics feel good about being Catholic. The “I’m Catholic” is a dead give away that it is not trying to persuade outsiders that Catholicism is true. Its purpose is to make Catholics feel like they are free thinkers. They no longer act under the will of someone else. They are a little unpredictable. They don’t fit into any man-made box. Nobody wants to be a conformist. Even the dullest, most conformist people on earth—leftist — think they are part of a small, enlightened elite who carry a dangerous message that will usher in a utopian future. I happen to agree with the statement that Catholics, and Christians, in general are a little less conformist than their secular peers. My only point is that the meme is targeted at influencing Catholics, not Protestants or other outsiders. A lie is more believable if it is accompanied by some truth. The more truth that is included, the subtler the lie. There happens to be a lot of truth in this meme so the lies contained therein are very subtle indeed. Let’s have a look. The biggest error of the meme is that it creates an equivalence of the truths contained therein. For example, opposition to abortion and opposition to the death penalty are treated as equally Catholic positions. For the one in authority is God’s servant for your good. But if you do wrong, be afraid, for rulers do not bear the sword in vain. They are God’s servants, agents of wrath to bring punishment on the wrongdoer. Paul was talking about the Roman authorities who had the power to use the sword to punish criminals. Now, the Church does say that improvements in incarceration have reduced the necessity of the death penalty, but that doesn’t make opposition to the death penalty mandatory. Again, the Catholic Church has always supported justice for immigrants. But the Church also teaches that prosperous nations are obliged to accept immigrants only to the extent they are able. The meme makes it sound like the only legitimate Catholic position is that prosperous nations should not put any limit on any immigration regardless of the reasons behind it. The true Catholic position is not as simplistic as the leftist position. It involves prudential judgment. It doesn’t mean that foreigners can immigrate for any reason. It also doesn’t mean that there are no expectations or burdens placed on immigrants. Does this mean that Catholics must support Black Lives Matter? Vote for Hillary Clinton? Favor affirmative action? What if the “inequality” is the result of hereditary differences in IQ? Some cultures value education more than others. For example, Indian culture tends to value education more than Americans do. This means that Indians are disproportionally more successful. Does this mean that Catholics should support depriving Indians of slots at elite colleges so that more whites can attend? But the person who created the meme is not the person who is trying to do something subversive. The subversion is coming from the hierarchy. The meme is merely reflecting what many bishops teach. Each of these cases involve prudential judgment, but they are frequently taught to be black and white issues like abortion. Why are the bishops teaching these doctrines as all or nothing when they know that the teaching is much more nuanced? I don’t know. Perhaps it is simply a way to win the applause of the world. Perhaps they can’t get out the full complexity of the teaching in our sound bite culture. Regardless of the reason, the failure of the bishop to fully explain these teachings exposes the Church to being used by Social Justice Warriors to achieve ends that are contrary to the mission of the Church. While working through my liberal RCIA, I encountered a concept called a “seamless garment.” Basically, it is the idea that a Catholic’s beliefs should perfectly consistent across all issues. So, if a Catholic is “pro-life,” they should oppose not only abortion, but also the death penalty since they both destroy human life. As for the lives destroyed by murder, they simply say a murderer is obviously not Catholic and needs to be called to repent and return to the Church. It is an ideology of all mercy and no judgment. Personally, I am “pro-family,” which allows for the use of deadly force to defend the family and inact justice, be it self-defense, war, or the death penalty. Yes, the seamless garment is a great tool of subversion. It is unworkable in practice. For most of man’s history, a failure to take up arms in self-defense resulted in men being slaughtered, their wives being raped, and their children enslaved. It would have been unchristian not to oppose the foe with deadly force. Are you coming into the Church this Sunday? Unfortunately, no. The nun at my local parish finally decided I was ready, but wanted to first put me through something called “Rite of Welcome” in April and then Confirmation in November. I’ll be transferring to a more traditional parish in May, but I do not know exactly when I will officially enter the Church.